A Chinese navigation satellite was successfully hauledinto orbit Friday to kick off a busy year in space that will include the launchof the country's first probe to study the Moon. Liftoff of the Beidousatellite was at 1628 GMT (11:28 a.m. EST) from the Xichang space launch centerin southwestern China's Sichuan province. The three-stage Long March 3A rocketdeployed its payload into the planned orbit 24 minutes later, according to China's state-run Xinhua news agency. The craft is bound for acircular geostationary orbit about 22,300 miles (35,888 kilometers) high, whereit will join three other Beidou craft launched during the past seven years. The Beidou satellites arethe first group in a series of space-based navigation platforms called Compass.The fleet should become operational next year for much of China, but it could take several more years before it can be used worldwide, according toXinhua. The Compass system willsupply users with precise positioning data similar to information produced bythe U.S. Global Positioning System. The launch came less than amonth after China conducted a controversial anti-satellite weapons test. Theexercise destroyed an aging weather satellite and drew criticism from the United States and other governments around the world. 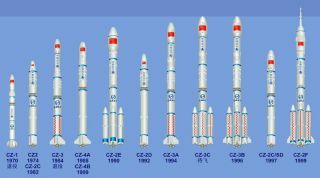 China plans a quick pace of orbitallaunches for 2007, with up to ten launches on tap before the end of the year. A major highlight for theChinese space program will be the launch of the Chang'e 1 lunarorbiter in April. The probe will blast off atop a Long March 3A rocket andwill orbit the Moon at an altitude ofapproximately 125 miles (201 kilometers), according to the People's Dailynewspaper. Chang'e 1 will create a detailedmap of the lunar surface and analyze the Moon's soil content, Chinesescientists said. The craft is the first stepin a comprehensive lunar exploration program in development by China.Further missions could feature landing craft and a probe to return rock samplesto Earth. Other launches scheduledfor this year include the next satellite in a joint Earth observation fleetoperated by China and Brazil. CBERS 2B will be the third spacecraft in theprogram, and officials will set an official launch date during a joint projectcommittee meeting in March. China's second marinesurvey satellite, called Haiyang 1B, could be launched in April to begin amission to monitor ocean conditions such as temperature and winds, officialstold People's Daily. Two communicationssatellites are also on China's space manifest for 2007. The televisionbroadcasting and relay craft are to be launched in June and October to helpprovide media coverage for the 2008 Beijing Olympics. China hasalso been updating its weather satellite system in preparation for theOlympics. A next-generation polar-orbiting meteorological satellite is plannedto launch in late 2007, Xinhua reported. The Sinosat 3communications satellite will launch in May, and a number of other commercial,scientific and military craft could also be put in space this year. Chinese workers are alsoworking to prepare for the next step in the country's human spaceflightprogram. Slated for launch in 2008, Shenzhou7 will carry China's firstthree-person crew into orbit for a flight lasting several days. During the mission, atleast one astronaut will exit the capsulefor a spacewalk - another first for the nation's burgeoningspace program.